Find Out Why St. Pete Beach Is One Of The Best Beaches In The U.S.
St. Pete Beach is one of the finest beaches in Florida. If fact, it is ranked number 3 on Trip Advisor’s 2017 list of the Top 25 Beaches in the whole United States. Did you know, however, that there is more to St. Pete Beach then super soft sand and crystal clear Gulf Waters? St. Pete Beach is a barrier island, near the Pinellas County mainland, which is home to St. Petersburg. Located within 30 miles of airports in both Tampa Bay and St. Petersburg-Clearwater, St. Pete Beach is an easy access destination. Miles and miles of sugar soft white sand provide the canvas for the more than 300 days of pure Florida sunshine that shines down on our beach. 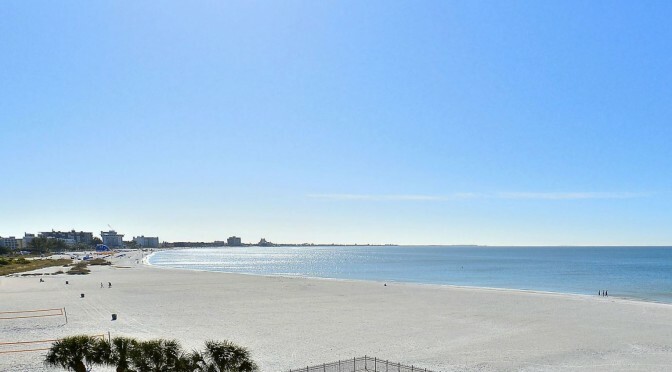 St. Pete Beach is the perfect getaway for families seeking a fun vacation spot, couples celebrating milestones, seniors looking to escape colder climbs and pretty much anyone who loves the beach. The crystal-clear gulf waters of St. Pete Beach are perfect for paddle-boarding, skim-boarding, parasailing and jet skiing. and other water sports. There are many outfitters to rent equipment from along the shore. Those who prefer a lower impact water adventure will love snorkeling near the beach. There is the Pete Beach Reef as well as an artificial reef system that gives scuba divers tons of amazing underwater territory to explore. Experienced and novice fishing enthusiasts alike will enjoy the numerous opportunities to try out your skills on and near St. Pete Beach. Many varieties of fish are plentiful all year round in the Gulf waters. There are numerous fishing charters along the beach that can take you offshore into the Gulf. Or, stay close to the beach and try reeling in the big one from many prolific dry land spots. The Salvador Dali Museum in downtown St. Petersburg houses the largest collection of the master Dali’s work outside of Europe and is home to 7 of the 18 definitive masterwork paintings from this great artist. The museum is a jaw dropping piece of architecture in and of itself, with a stunning 75-foot-tall glass entryway and skylight. The museum’s walls are constructed of 18-inch-thick concrete to protect the delicate collections from potential hurricanes. In addition to the incredible collection of its namesake and other creative artists from around the world, the Museum hosts several travelling exhibits throughout the year and presents educational and information programs open to the public. Passe-a-Grille is a small beach town just south of St. Pete Beach. Largely unchanged by the years, Passe-a-Grille offers a quiet stretch of sand set against a lovely sea dune covered in sea oats. The town itself has one of the largest Historic Districts on the Gulf Coast, with cute shops and quaint beach cottages. St. Pete Beach has tons of great family friendly fun. Enjoy horseback riding on the beach. Visit the nearby Clearwater Aquarium and meet the stars of “Dolphin Tale.” Rent bikes and venture down the Pinellas Trail which connects St. Petersburg to Tarpon Spring along an old railroad route. The kids will love visiting the Great Explorations Children’s Museum in St. Petersburg, which is chock full of scientific and creative fun. Plan a stop at John’s Pass and take a pirate cruise. Or just spend time together, building sandcastles or hunting sea shells on the beach. Whatever you choose to do in St. Pete Beach, you will make memories that will last lifetimes.